About the Modern Transit Society, Inc.
MTS existed between 1971 and 2011. Below are some of its accomplishments. The Modern Transit Society, Inc. (MTS) was founded in 1971 and is a non-profit, advocacy organization for transit in Santa Clara County, California. Membership is free. At one time, it had over 800 members in Santa Clara and Sacramento counties, but membership has reduced as goals were accomplished. Our accomplishments and current activities best explain what we are all about. Promote clean air, safety and mobility through transit. implementing an efficient alignment of the Vasona light rail line into downtown San Jose. We support the Fast Track described in our newsletter. eliminate pedestrian prohibitions from arterial roads. See our Expressway Topics, Links page. continuing our efforts for reduction of automobile subsidies. opposing Santa Clara County highway engineers' recent plan to add lanes by forcing pedestrians to walk in the traffic lane. try to save the old San Francisco-Oakland Bay Bridge for future train service even after the new bridge is built. The lower deck that had electric trains until 1958.
eliminate the forcing of pedestrians to walk in the traffic lane of 45 mph, including accessing LRT stations! See our Sunnyvale campaign. We have various topics brought up at our monthly meetings in Sunnyvale and in Sacramento.We also have an annual dinner meeting. MTS logo used from 1971 to 1987. Now, the logo is the name in the Palatino font. MTS was the leading organization behind bringing back light rail transit in Santa Clara County and Sacramento County. MTS also worked to get people movers (or automated guideway transit) approved at the San Jose Airport, and to bring BART to San Jose. However, MTS preferred a direct BART route to downtown, not the longer route now planned via east San Jose. MTS fought for pedestrian access to all arterial roads, and as a result, the County Board of Supervisors required sidewalks along all expressways in 2009. Sidewalks along Lawrence Expressway, and most of Capital Expressway, have already been completed. County highway engineers had fought against the sidewalks and the requirement for bike lanes. MTS also fought highway interests who, on numerous occasions, tried to raid transit funds and/or pedestrian funds to use for more highway construction. MTS was instrumental in the return of light rail transit during the 1980s to both the South Bay and Sacramento. MTS pioneered the fight for creation of the Capitol Corridor trains by its 1988 press conference, and convinced Assemblyman Tom Hannigan to author legislation that resulted in that service starting in 1991. MTS got Automated Guideway Transit (AGT) or People Movers approved for consideration for the San Jose airport. MTS then supported the successful petition drive that would require a rail link between the airport and the light rail line. This will go to the voters of San Jose in 2000. MTS has put a stop to the county highway engineers' practice of destroying sidewalks and bike lanes when adding lanes for automobiles by a request to the County Supervisors in 1991. In 1997, ten miles of sidewalks were completed along Lawrence "Expressway" as a result of efforts by MTS. In 2009, the County Board of Supervisors, as a result of MTS' efforts, required sidewalks along all expressways, usually on both sides of the road. MTS has forced the removal of PEDESTRIANS PROHIBITED signs from many roads where the name was changed from "avenue" or "road" to "expressway", most recently Capitol Expressway (formerly named Capitol Avenue) in 1997. The effort continues. These roads are not freeways but 45 mph arterials having stop lights, crosswalks, bus stops and often sidewalks (which were also "PROHIBITED"). MTS devised the concept of cashout which is now starting to be implemented. Cashout is equalizing the parking subsidy at employment, so that bicyclists, transit patrons and walkers get the same benefit as solo-drivers. A company pays employees to not drive. This action alone will decrease car commuting by 25% (the average of ten studies on this topic). Cashout has already been implemented at some companies. We are working to include cashout into the Countywide Deficiency Plan of Santa Clara County. MTS has worked to abolish subsidies to the automobile, and to protect transit funding from highway interests who tried many times to use transit funds for road construction. MTS works to educate the public, planners and politicians to the benefits of guideway transit. Sometimes we get overwhelmed by pro-highway forces. In the South Bay, MTS tried for years to implement light rail transit in the West Valley Corridor. Instead, a freeway was built (Rt. 85). We oppose the highway interests' tactic of placing highway and transit funding on the same ballot measure, a tactic that prevents people from voting for transit and against more highway subsidies. We offer solutions to traffic congestion without increasing highways and automobiles. MTS believes in permanently decreasing or even eliminating traffic congestion in a way that benefits all transportation modes, including the auto user. This can only be accomplished by use of free market principles and full cost pricing to decrease the demand for auto use. To accomplish this goal, MTS has written the Free Market for Transportation Plan. As the extensive goals became accomplished, including "Clean Air in the South Bay", interest and attendance at meetings decreased. Despite interesting speakers at annual meetings, attendance kept dropping, and also for the monthly meetings. Concurrently, politicians began to support transit, bicyclists and pedestrians, so the need to "educate" was reduced. Co-founder Al Spivak and President Robert Williams passed away. The last major accomplishment of MTS was the requirement for sidewalks along all expressways (45 or 50 mph arterial roads), which was approved by the County Board of Supervisors in 2009, after years of opposition by the County highway engineers who only wanted to use their budget for motor vehicles. There was no formal meeting to disband, but there was a lack of interest after the passing of the President. The last meeting was in November, 2011. 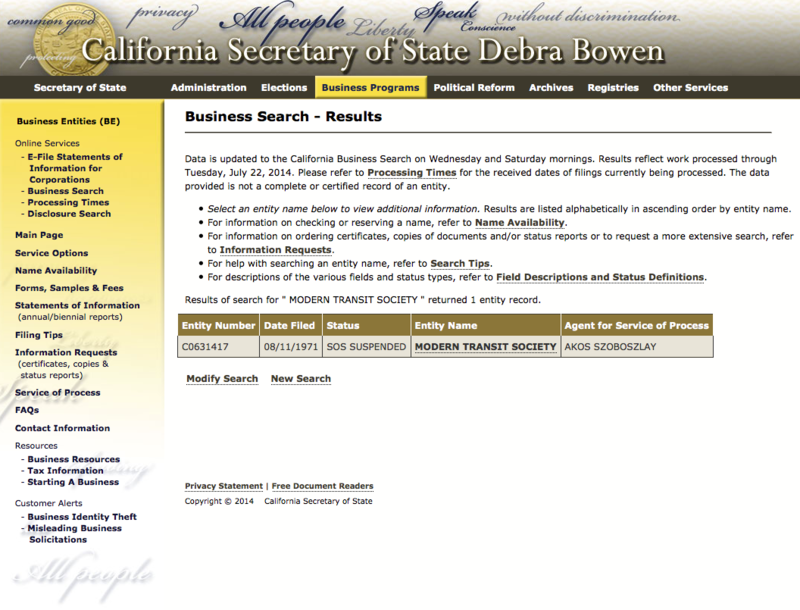 Here is the status from the California Secretary of State.